These updates can help you understand how federal health reform legislation and the Affordable Care Act (ACA) may impact your plan. We encourage you to work with your attorney and other business partners to comply with these changes. The Alliance does not provide legal advice. The National Alliance of Healthcare Purchaser Coalitions has submitted a comment letter on the American Patients First drug pricing blueprint that aims to lower drug prices and reduce patients’ out-of-pocket costs. The Alliance is a member of the national organization on behalf of its member employers. The National Alliance of Healthcare Purchaser Coalitions has published its latest Health Policy in Transit: Working to Make Wellness Voluntary – Moving Forward in the Absence of New Guidance. Questions may be directed to Michael Thompson, president and CEO of the National Alliance, at mthompson@nationalalliancehealth.org or 202.775.9300 x200. The letter notes that employers provide coverage to 177 million Americans, making employer-sponsored benefits the largest source of health care coverage in the country. “Chief among the threats to employer-sponsored coverage are proposals to tax workers’ health coverage, whether by preserving the ACA’s 40 percent “Cadillac tax” or imposing new taxes on employer health benefits,” the letter states. The letter was also signed by the American Benefits Council and other industry groups. The Alliance is a member of the American Benefits Council on behalf of employers who belong to the cooperative. The Council has noted that it will continue to engage policymakers and emphasize the importance of the employer-sponsored system as Congress considers the American Health Care Act. Read “A Purchaser Viewpoint” of the health policy issues that are part of ACA reform. This overview was produced by the Government Affairs Affinity group of the National Alliance of Healthcare Purchaser Coalitions. The Alliance is a member of this national purchasing alliance. Compare proposals to replace The Affordable Care Act: Compare Rep. Tom Price, House Speaker Paul Ryan, Sen. Bill Cassidy and Sen. Rand Paul’s alternative plans to The Affordable Care Act. 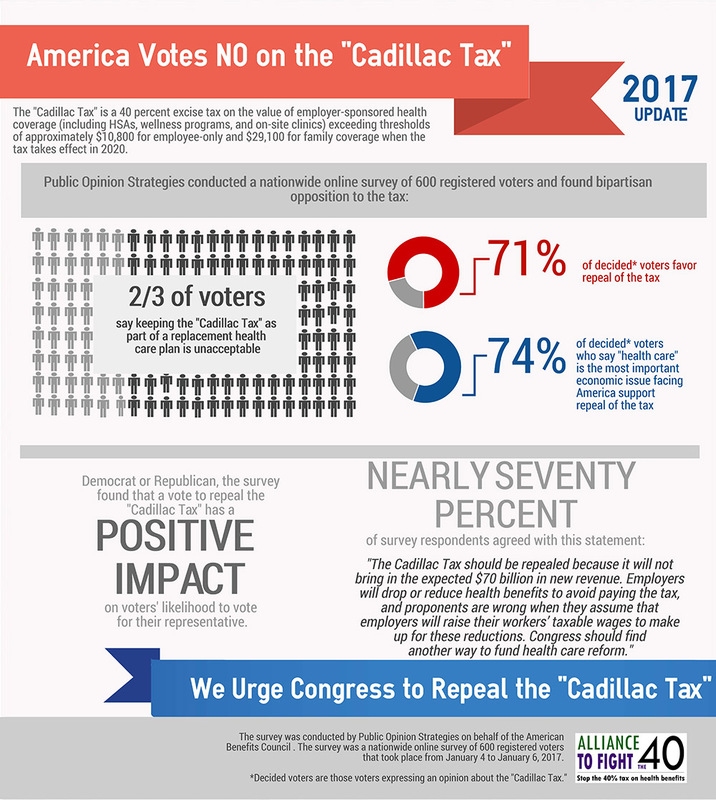 A new survey shows the voters favor repeal of the Cadillac Tax by a 2-to-1 margin. The survey sponsored by the American Benefits Council. © 2017 American Benefits Council. Reprinted with Permission. 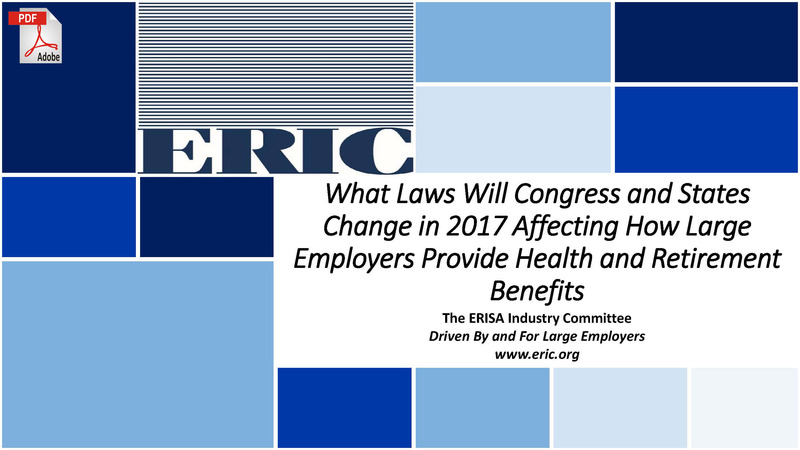 What laws will Congress and the states change in 2017 that will have an impact on employer’s health and retirement benefits? The ERISA Committee shares its insights to help you anticipate what’s ahead. 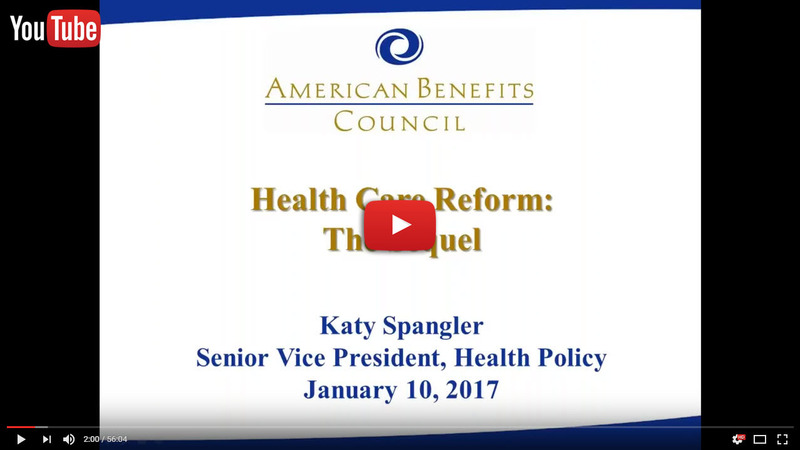 Katy Spangler, senior vice president, health policy of the American Benefits Council provides an expert summary on what lies ahead for health care and the Affordable Care Act. The Internal Revenue Service (IRS) recently extended the due date for furnishing individuals with Forms 1095-C and 1095-B from Jan. 31, 2017 to March 2, 2017. The extension is included in Notice 2016-70, which also offers relief from Affordable Care Act (ACA) penalties when reporting entities can show they made “good-faith” efforts to comply with certain 2016 information-reporting requirements. The deadline extension was sought by the American Benefits Council. The Alliance is a member of the American Benefits Council on behalf of employers who belong to our cooperative. The extension is automatically available to all employers; requests do not have to be sent to the IRS. The IRS has said it will not formally respond to extensions already sought by employers. The due date for IRS 2016 Forms 1094-B, 1095-B, 1094-C and 1095-C remains Feb. 28, 2017 or March 31, 2017 if filing electronically. Automatic extensions are available by filing a Form 8809. The U.S. Department of Health and Human Services (HHS) has issued a model notice that the Federal Exchange will send to employers when an employee enrolls in an exchange plan and is found to be eligible for a premium subsidy. Employers who are offering an “affordable/minimum value plan” and receive this notice will then have an opportunity to contact the Federal Exchange and provide information verifying that an “affordable/minimum value plan” was offered. That information would then trigger a review of the employee’s eligibility. If an employer’s plan does not meet “affordable/minimum value plan” standards, the employer may be subject to penalties as part of the “employer mandate” that is enforced by the Internal Revenue Service (IRS). The Department of Labor (DOL) has released the final summary of benefits and coverage (SBC) form and related materials in February 2016. You can find the new form on the Summary of Benefits and Coverage and Uniform Glossary page of the DOL website. The new template is several pages shorter than the current form. The question about annual limits in the “Important Questions” column is no longer allowed by the ACA, so it has been deleted. The new template contains disclosures related to whether the plan provides minimum essential coverage (MEC) and meets minimum value (MV) standards. The current SBC template for use through March 31, 2017 also remains available on the DOL website. The SBC is intended to help people better understand their health plan coverage. Share with your employees: The IRS is providing information to individual taxpayers regarding the new forms they might receive regarding health coverage they had or were offered in 2015. Taxpayers may need to refer to this information when filing their individual tax returns. Read the Q&A document here. Read our blog: Get Ready, Get Set, Go: ACA Reporting Deadlines Are Almost Here, by Annette Cruz, health policy consultant. Watch an overview and a guide to filling out the forms. John Barlament, a lawyer and partner with Quarles & Brady LLP, Milwaukee, presented an overview of employer reporting requirements during The Alliance Employer Benefits Roundtable at Monona Terrace on Dec. 1. Congress has passed a two-year “Cadillac Tax” delay, postponing the effective date to 2020. Read the American Benefits Council release. The Alliance has joined a coalition to “Fight the 40” – a diverse, national consortium of employers, health plans and union groups organized by The American Benefits Council. This coalition continues to seek repeal of the 40 percent excise tax, which Congress recently delayed until 2020. Read more here. Read an open letter from The Alliance to the IRS. Webinar Recording – Watch this webinar or download the slides to learn more about proposed excise tax regulations. April 2016: Health Care Roundtable with Alliance President and CEO Cheryl DeMars and other industry leaders, published in InBusiness. The US Department of Labor’s Employee Benefits Security Administration (EBSA) is the enforcement agency for employers on most non-tax related ACA provisions. EBSA has created two self-compliance tools for employers that serves as a guide to ensure your plan is compliant with new provisions of the Affordable Care Act. EBSA is available to answer any questions you may have by phone at 866.444.EBSA (3272). For questions about tax-related ACA provisions, the IRS has created a web page listing fact sheets and guidance on Affordable Care Act provisions. A separate page lists legal opinions and resources. A new website, business.USA.gov/healthcare, provides information specifically for employers regarding the Affordable Care Act. This ACA “wizard” is designed to provide guidance specific to employers by size. Additional SBC resources were shared at the August 2012 Alliance Learning Circle on health care reform – download them here. Guidance Issued Specifically for Self-Funded, Non-federal Government Plans from The Center for Consumer Information & Insurance Oversight. Part I – Q & A about grandfathered status, internal appeals and external review, dependent coverage, o-of-network emergency services, and highly compensated employees. Part II – Q & A about grandfathered status, dental and vision benefits, and preventive health benefits. Part IV – Q & A about grandfathered status and lifetime limits applicable to essential health benefits. Part V – Q & A about preventive health benefits and value-based insurance designs, auto-enrollment, notice requirements for plan changes, adult dependent coverage, pre-existing exclusions, grandfathered plans, the Mental Health Parity and Addiction Act (MHPAEA), and wellness program initiatives. Part VII – Q & A about about four-page summary of benefits and MHPAEA. Part XI – Q & A about a number of issues. Confirms that employers will not be required to issue notices to employees about exchanges until regulations are issued later in 2013. Part XII – Q & A that clarifies provisions impacting plan designs for self-funded plans and the coverage of preventive services. Part XIII – Q & A addressing expatriate plans. Part XIV – Q & A about SBC requirements. Provides new clarifications and a link to updated templates. Part XV – Q & A about annual limit waiver expiration dates, provider nondiscrimination rules, coverage for those in clinical trials, and transparency reporting. Part XVI – Q & A about issuing the Notice of Coverage Options and complying with the 90-day waiting period limitation. Part XIX – Q & A about COBRA continuation coverage, out-of-pocket maximums, preventive services, SBCs.